Right from when I was 15 years, I was very passionate about cooking new things, which I saw on television and around the same time I was also addicted to TV shows like Eat Street, Master Chef Australia, and Food Safari etc. So, I ended up making a dish every day for myself and for the family, but only with the ingredients that were available at the local store. The dish, which I used to make ended up in a different color, texture, and size, but with minor altercations, which could be easily noted and it was mainly because of the ingredients used. One lazy Sunday, I was watching a chef cook Italian pizza on an Indian cookery show and that got me thinking to another level, and I decided to make a pizza but in my own style. By then, I had realized that the food could be made, through different available ingredients in the market, which can give a new and better taste, to the dish every time you make it. I had some green peppers, colored bell peppers, sweet corn, some mushrooms, cheese but no pizza base, and at that time we didn’t have oven even. So, I decided to make my pizza bread on Indian pan called “Tawa or a Frying Pan”. I decided to follow recipe of pizza dough from internet but couldn’t get some key ingredients like dry yeast. The thought struck that Indians to have bread, why can’t I use that as my pizza base? On rummaging in the refrigerator, which was an old habit, I found whole-wheat dough that was kneaded for our lunch to make hot phulkas and some mashed potatoes masala, remains from the morning breakfast. I made a thick and crispy aloo parantha on which I placed everything like we normally do on pizza, added cheese, herbs, chili flakes, covered it with a lid to get the cheese to melt. The end product looked yummy, tasted even better than a pizza and also looked like a pizza, that’s how I came up with my Indian version of pizza called “Pizza Parantha” which became my signature dish. 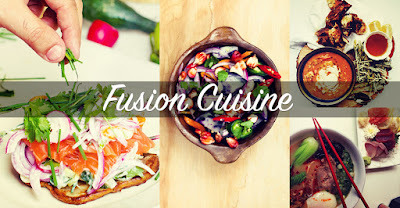 Fusion became a part of my daily routine, I tried something or the other each and every day, some days I was a success and some days it would be a disaster. One thing that was consistent in this trial and error period was that every day I would cook and didn’t lose hope. Few things that I think I created magic was with of course my signature dish and also few dishes like paneer infused thecha, the bird’s nest, pasanda foam, coconut garlic sand etc. Today, FUSION for me is my imaginary world where I can go anytime I want, and can mix up different food. I want people to try this interesting mix that I cook up now too frequently and enjoy the food the same way as I enjoy in cooking.